I finally received the results of my DNA tests last week. As I said in my first post, I used the company Family Tree DNA. Mostly because I’d read on-line reviews that insinuated that you got more detailed results with them. 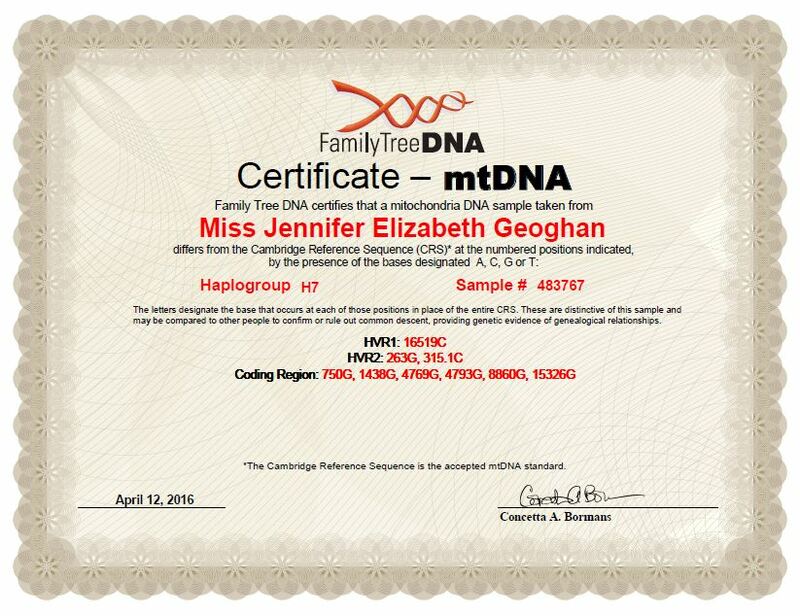 I did two tests, the Family Finder and the mtDNA. The Family Finder tested you for your whole spectrum DNA and the mtDNA only tests your maternal line DNA. Since there’s quite a bit of info here, I’m going to split this up into two posts. Regina has been impossible to track down past her passenger manifest to America in 1850. The only scrap of info I had as a lead was an old family rumor that the female line in the family had Jewish roots. I was hoping that with this mtDNA test, I’d be able to prove or disprove this theory and perhaps find someone else with the same line where we could share info and find a way to break through my brick wall. When the test results came back in, I have to say I was annoyed that they are so vague. Perhaps it’s just the test itself, but I was annoyed by the way in which the results are explained to you. I’ll get to that later on. First of all, this is the dashboard you get on the website when you log in. Let’s start with my Matches. 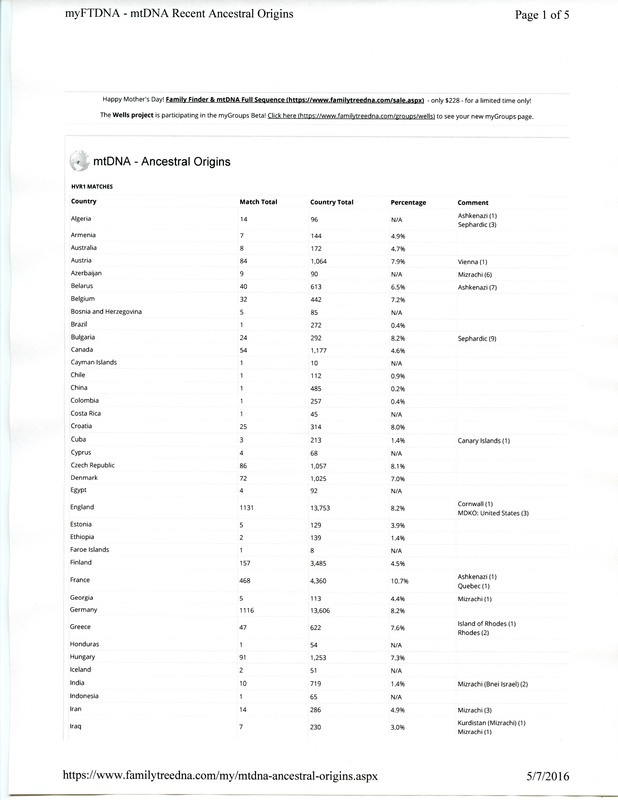 As you can see below the website has listed folks who, like me, are in their database and have been found as a match for their mtDNA, maternal line DNA. (I’ve blacked out their last names for their privacy.) Under the column “Genetic Distance” a 0 (zero) means we are an exact match and that our family connection is the closest. As the numbers go up, our common ancestor goes farther back in time. 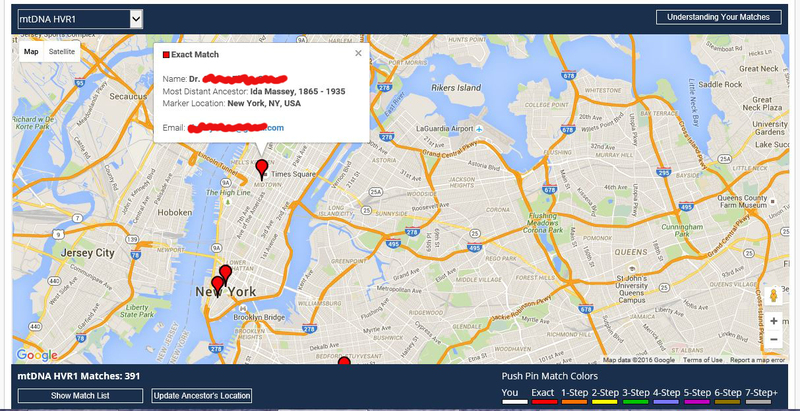 The other info listed is the ancestor the person listed on their profile as the farthest back they can trace. If you click on the little blue square that looks like a family tree it will show you the family tree that person built on the site. I found it extremely useful to be able to look at their family tree to see if I could find any commonality. If you click on the envelope you can also email these folks to see if they want to work with you on your research. The next item on the dashboard is my Ancestral Origins. 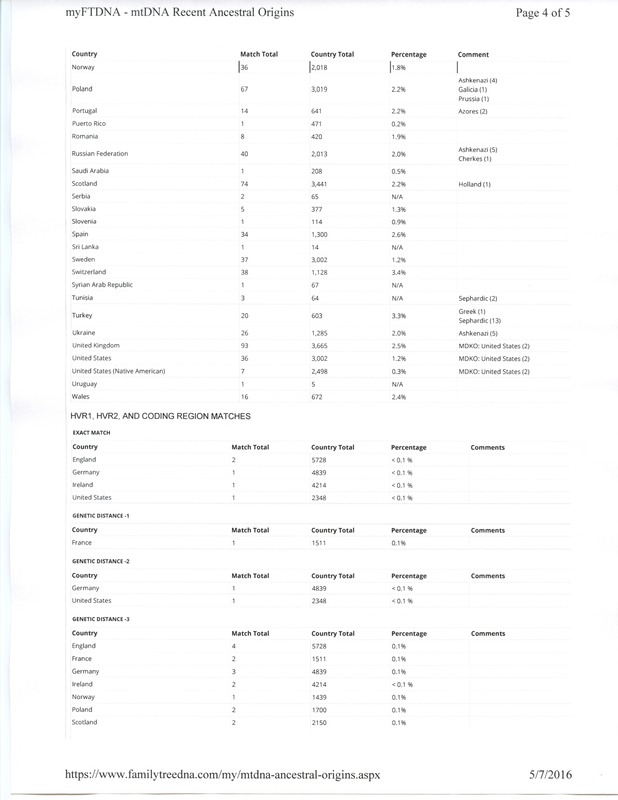 This report was what annoyed me the most about my results, mainly because Family Tree DNA gives you no explanation of what it means. I actually had to call them up and the explanation I did get was really strange. Here’s the first few lines of the report. I’ll scan and attach the full one below as well. 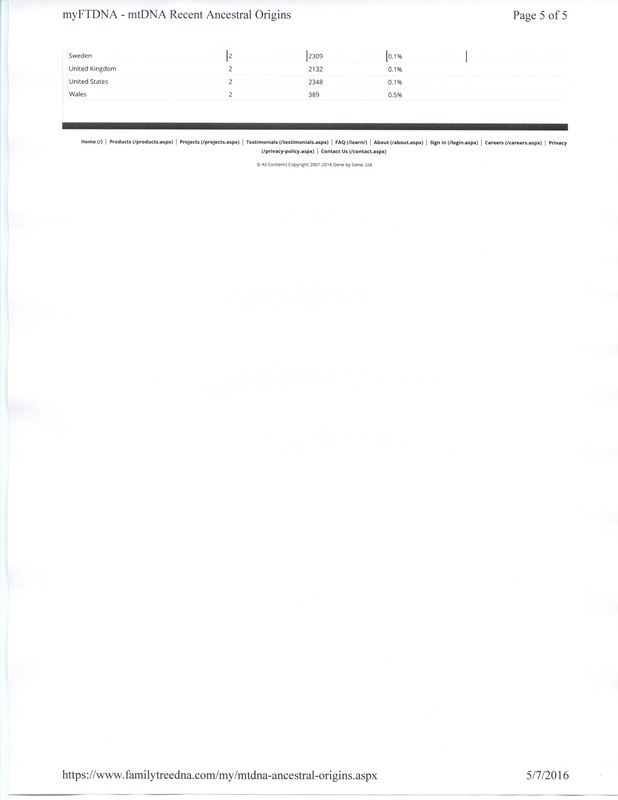 Another thing I didn’t like was that there is no way to download these results as a PDF. 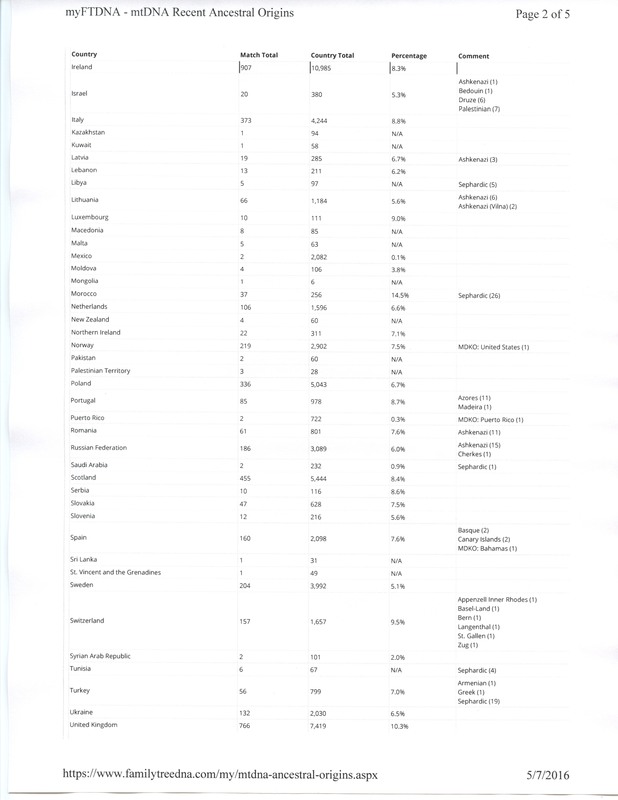 Country Total: The total number of people in the Family Tree DNA database that claim to have ancestry in the country listed. 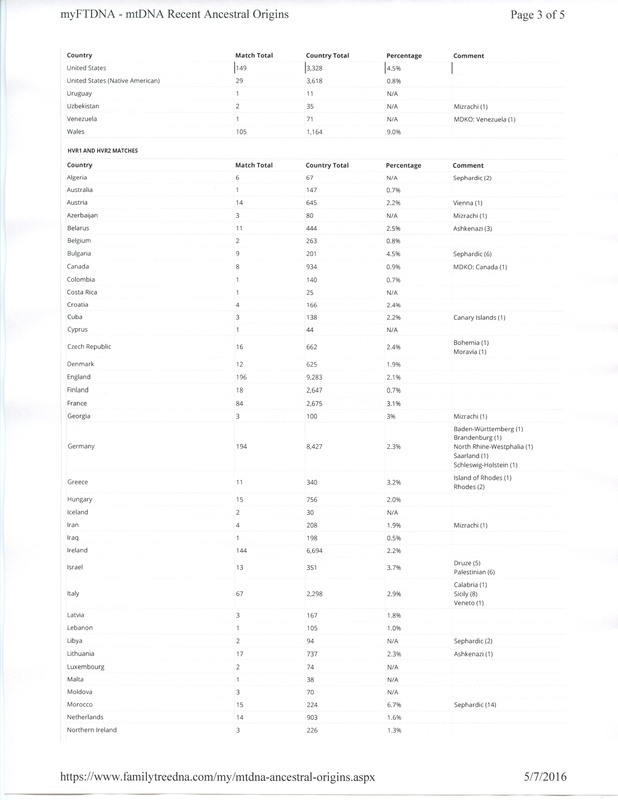 Match Total: The total number of people listed in “Country Total” that are actually matches to your mtDNA. Percentage: The percentage of people in “Country Total” that are in your “Match Total.” Yes, had I a calculator, I could have figured this one out for myself. Comment: Either a region of that country or ethnic people of that country that your matches have listed as part of their ancestry, which of course is pretty subjective as it could very well be based of family rumor more than truth proved with evidence. 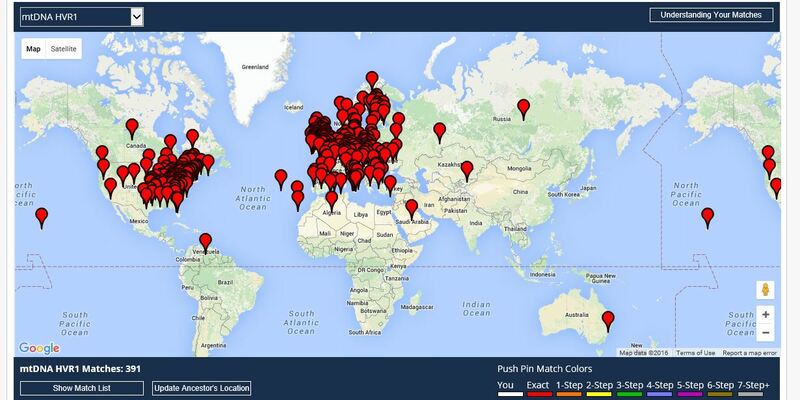 Interestingly enough, my highest percentage of match came from the country of Morocco with 14.5%. When I called customer service to ask for an explanation of this report, even the Family Tree DNA rep said this report was kind of weird. When I asked about ways to find out if I was Jewish or not, he said that by the extremely large amount of Jewish ancestry noted in the comments fields of my report that odds were extremely high I had Jewish roots on my maternal line! No, I didn’t get exacting scientific proof … yet … but that was good enough for me. Yeah! 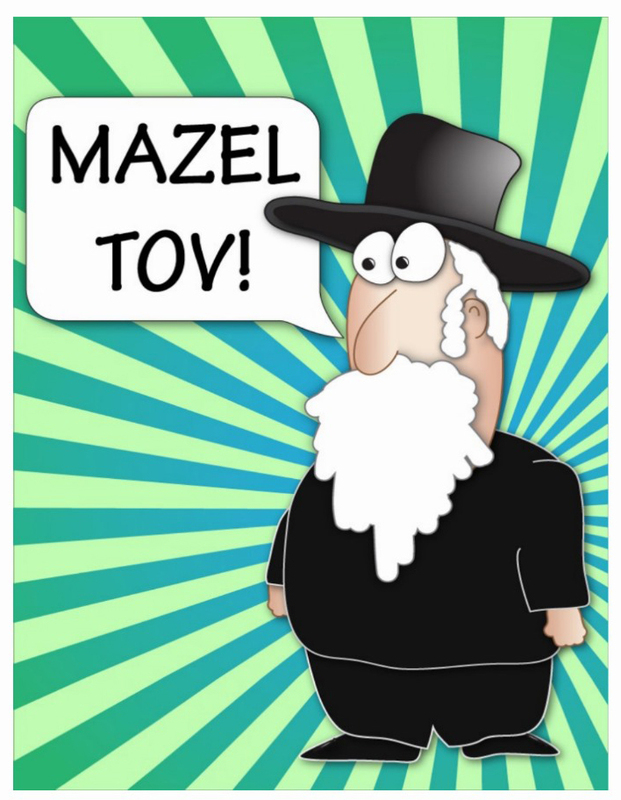 I’m a Jew. I’ll take it where I can get it. I’m so tired of just being plain old white bread European. If you zoom in on a place, here’s what you see. If you click on a pin, the info for that person pops up. All things considered, this is just another way of looking at your matches. 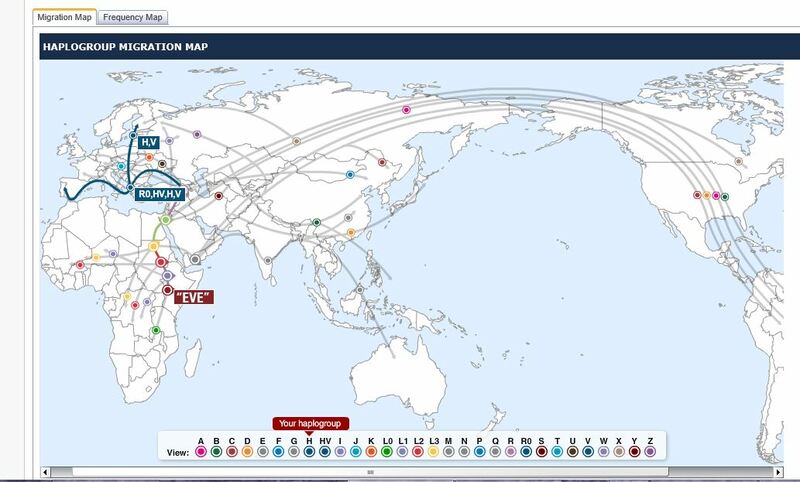 The next item on the dashboard is the Migration Map. Here’s what it looks like. There is no explanation to help you understand what this map really means so I honestly have no clue what it’s supposed to tell me. You’d think if they went through the trouble of creating it, they’d at least want you to understand it. 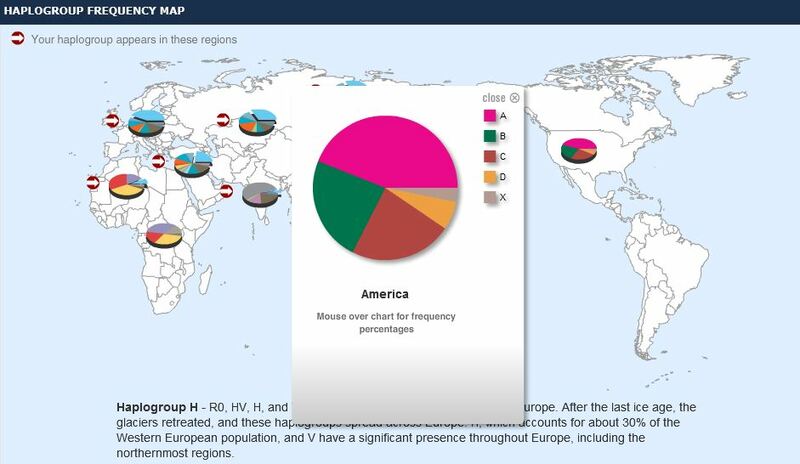 At least this map gives you a little explanation, but then when you click on one of the pie charts, I’m lost again. It doesn’t explain what A,B,C,D and X are for. 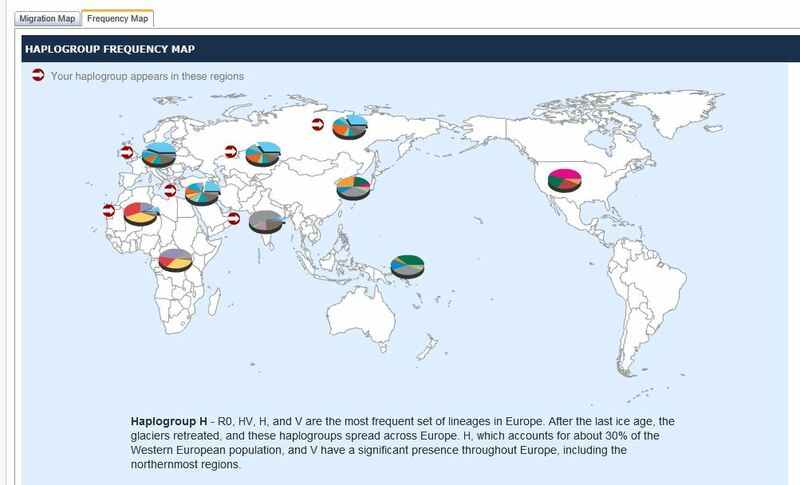 Next on the Dashboard is the Haplogroup Origins. Take a look for yourself, but I don’t see how this differs from the Ancestral Group origins report much. The only other certificate was the migration map which was kind of redundant. So what did I think of this test? I have mixed feelings. I get the impression that no matter what company I used, I was going to have a difficult time proving my Jewish heritage and really that was the only reason I did the test. I feel that there is interesting results to be had here, but was disappointed that Family Tree DNA did such a poor job of interpreting these results in an easy to understand way. I think the Family Finder test results were more interesting. That test will be my next post here. Jennifer Geoghan, Genealogist and author of The Purity of Blood novel series and If Love is a Lie: A Partly True Love Story.